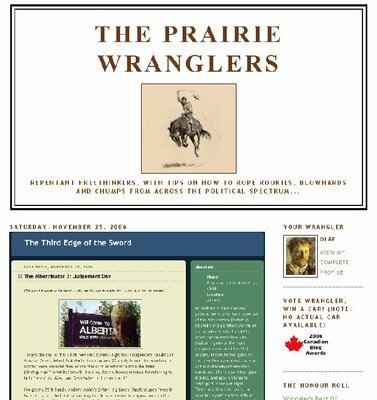 The Prairie Wranglers blog has recently been nominated as "Best Conservative Blog" in the "Canadian Blog Awards". 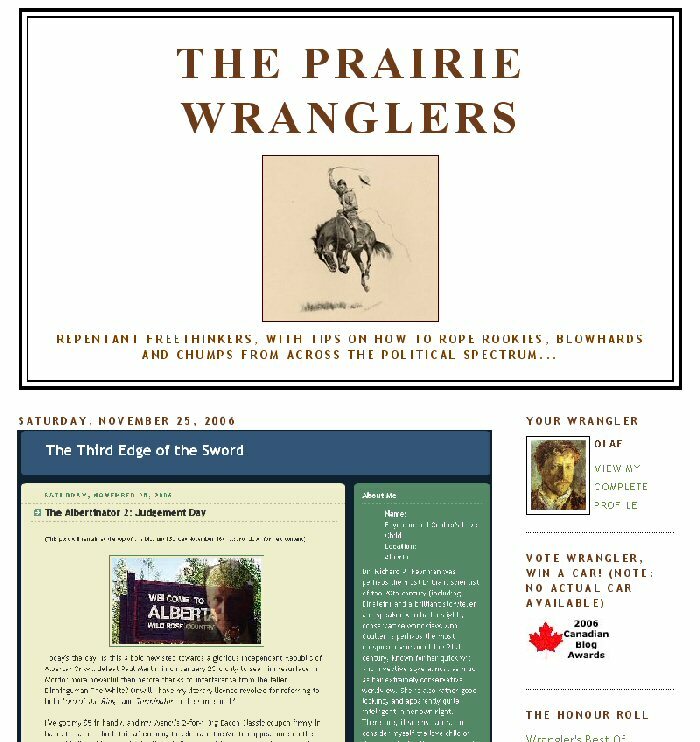 This is the first year that Wrangler has been online (and therefore qualified) for the awards. There's another blog out there that is also in its first year and has therefore qualified for the awards for the first time. Yet no nomination. [and no 62 comments in a single post either -ed] I must say I'm heartbroken. Is it because he's figured out how to do this "preview part of a post and click to view the rest" trick in blogger that has eluded me? Because every post starts with a pretty picture, while I've been known to do 16 text-only posts in a row? Because Small Dead Animals accused him of liberalism knows who he is? Just came across this post of yours. I'm sorry to hear you're heartbroken, it is a sensitive subject for us all. I can't quite explain my modest success, however I can provide you with the information on how to do the expandable post trick, which does make it easier for people to navigate through... and the picture thing is quite a scam, you're right. Also, do you submit your best posts here?